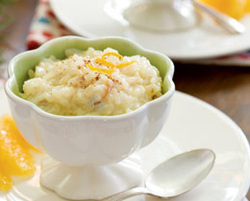 This is a great recipe for left over rice or even a quick easy desert for those living on less than a dime and want a healthy sweet treat for a cold winter night or if chilled a summer’s eve. As with all recipes make it your own by adding flavoring such as almond, orange, etc. or even a little brandy if you are daring enough. Use your imagination or let your children help since it is an easy recipe for them to try and learn from. Combine rice and 1 ½ cups milk, sugar and salt in heavy saucepan or skillet (which is what I use). Cook over medium heat. Stir occasionally until thick and creamy, 15-20 minutes. Blend remaining half cup milk and egg. Stir into rice mixture. Add raisins. Cook 2 minutes longer, stirring occasionally. Add butter and vanilla. Spoon this into serving dishes. Sprinkle with nutmeg or cinnamon if desired.